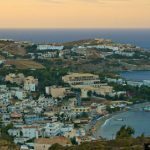 The town of Agia Pelagia itself caters well for tourists from all over the world, with excellent Tavernas serving up some of the best fresh fish dishes in Crete. There’s plenty of shops and souvenir stalls to browse and a few bars and pubs. 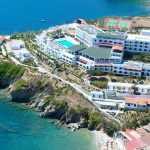 Agia Pelagia is the perfect destination for a family holiday, with watersports to keep the kids entertained, calm safe waters and your only a stones throw from Watercity. 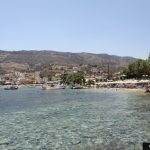 The first place most people head is to the beach of Agia Pelagia, its a nice sandy beach, and the seas around here are perfect for fishing and snorkelling. Investing in an underwater camera is well worthwhile to capture the sea life here. 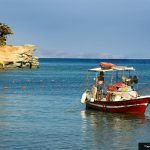 If your really interested in the sea life of Crete and Greece then pay a visit to CretAquarium in Gouves just an hour or so drive down the road. 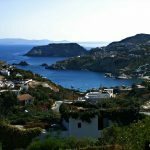 There are other beaches in the area of Agia Pelagia, one is called Mononaftis, a quiet beach sheltered by a large rocky outcrop. Also try Psaromoura beach, which is a nice and sandy with sun beds available and a small beach side cafe. 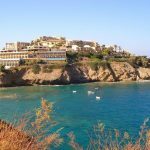 Another popular choice is Capsis beach, a beach situated on the peninsula, with its own private beach for guests of the Capsis resort. 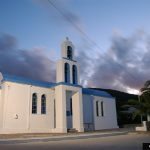 If its great food your after then there are plenty of restaurants in Agia Pelagia, our personal recommendation are Mouragio Restaurant, of which you must try the Souflaki and Mousakka. Also try Bazaar Bistro & Bar for Greek and European food. There are many little fast food places and pizza takeaway restaurants in the area, and you must try a Greek Gyros Pita while your on the island, its much better than anything you will ever find in the UK. 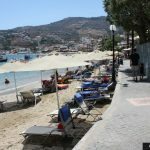 The nightlife in Agia Pelagia is not too hectic or over the top, its just enough for a great family holiday, the bas are mainly Greek, and you can sit in an assortment of bars and watch the sunset or the stars at night. The drinks here are well priced and not too expensive. Most bars do a selection of quality freshly made cocktails and the longer you stay in a bar, or visit a bar the more drinks you will see come for free, including free shots and snacks like cucumber or peanuts. 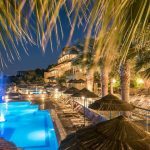 There are no real discos in this town, your best bet if you want to spend a night in the clubs is to head for Heraklion or even further away is Hersonissos, although that would mean quite a long taxi journey. Heraklion has a great range of clubs to visit, but expect the prices to be higher than that in Agia Pelagia. The first place you must visit is Fodele, the mountain village was home to the artist El Greco. Its a lovely village surrounded by orange and lemon groves. If sightseeing is what you want to do in Crete then you must visit the palace of Knossos, it was the main centre of Minoan activity in Crete and Greece as a whole. If its boat trips your after, then Agia Pelagia has a small harbour where you can catch boat trips around the coast, visiting the beaches of Bali and more, or taking a trip out to Dia or Dragon island which sits in the distance. Dia island has a lost village under the sea, which can be seen in clear waters from the boat or by snorkelling.